Perfectionist boss Dave Challinor believes there’s plenty of room for improvement in his AFC Fylde side even after back-to-back wins over promotion rivals Wrexham and Solihull Moors. 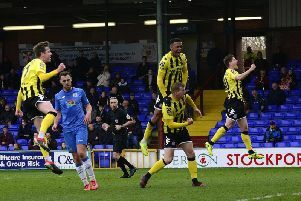 Saturday’s 2-1 win at Solihull moved Challinor’s fourth-placed Coasters within a point of second-placed Salford City in the National League. Even so, the manager felt they could have spared themselves some nailbiting in the Midlands by playing to their strengths throughout. Challinor explained: “We started really well and then switched off. I was a little disappointed that we played into their hands a bit and didn’t back ourselves in possession. “I am a perfectionist but there’s a way I want us to play and a philosophy that suits these players, and if we go away from that and don’t back ourselves we make it their type of game. That happened in the first half. “In the second half we started well and got the goal but then we did resort to not playing a bit. Players can have a mentality at 1-0 that you are safe dropping deep, but that can be dangerous because they are a bigger threat close to our goal. And Challinor’s belief that there is room for improvement even applies to Danny Rowe after two strikes by the league’s 21-goal top scorer sealed the win at Solihull. Rowe turned 29 this week and Challinor said of Fylde’s star player: “I’m one of those who will always think he can do better but he’s a matchwinner for us. “People will say he’s our best player and he is the most difficult to replace because goals are the toughest thing to replace. Fylde head to Northern Premier League club Ramsbottom United this weekend in the third round of the FA Trophy and don’t return to league action until the visit to Maidstone on Saturday week. Fylde trail leaders Leyton Orient by four points. Asked whether two excellent results have changed his view of Fylde’s promotion prospects, Challinor said: “There’s no reason why we can’t end up at the top but if anyone offered me the play-offs now I’d absolutely take it. “I’d love to be in a position to guarantee second or third but first and foremost it’s about guaranteeing we are in there. Once you’ve done that, if there’s potential to win the title, then that’s where you go.